Business process engineering: an overview The goal of business process engineering (BPE) is to define architectures that will enable a business to use. 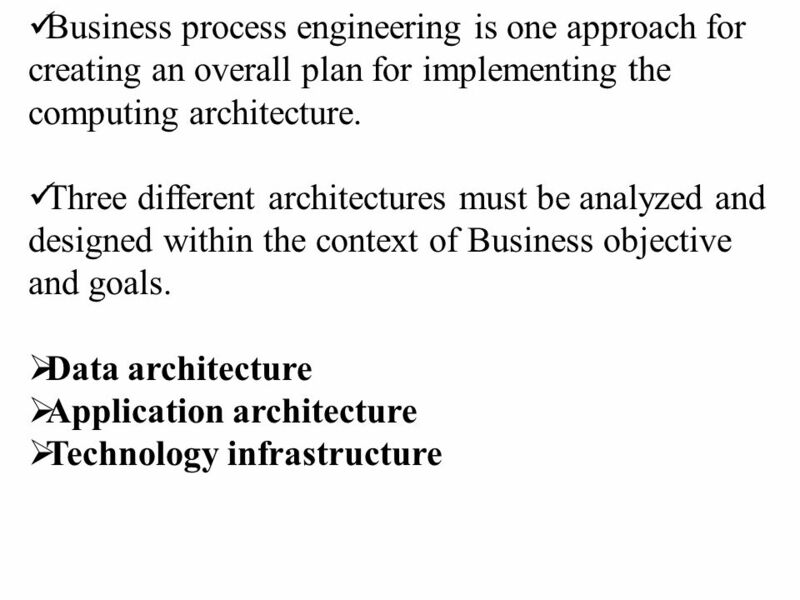 1 Business process engineering: an overview The goal of business process engineering (BPE) is to define architectures that will enable a business to use information effectively. When talking a world view of a companys information technology needs, there is little doubt that system engineering is required. Not only is the specification of the appropriate computing architecture required, but The software architecture that populates the organizations unique configuration of Computing resources must be developed. 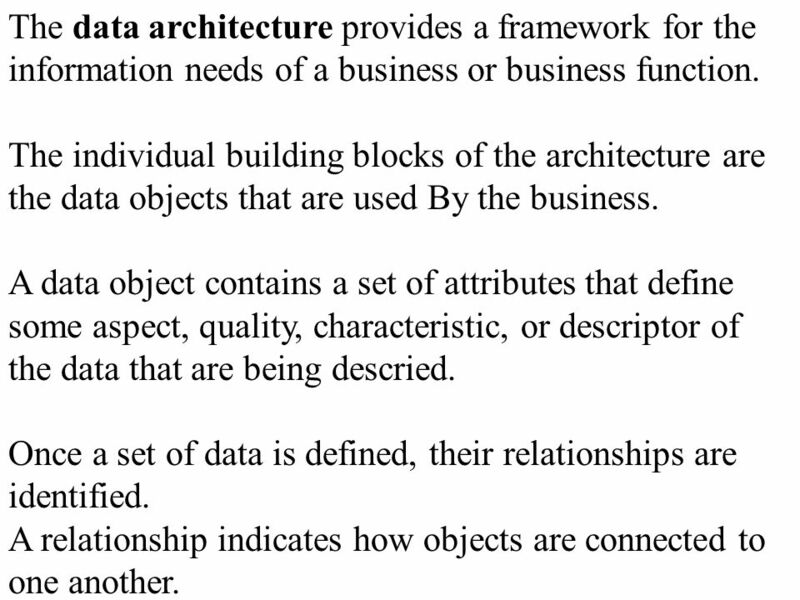 3 The data architecture provides a framework for the information needs of a business or business function. The individual building blocks of the architecture are the data objects that are used By the business. A data object contains a set of attributes that define some aspect, quality, characteristic, or descriptor of the data that are being descried. Once a set of data is defined, their relationships are identified. A relationship indicates how objects are connected to one another. 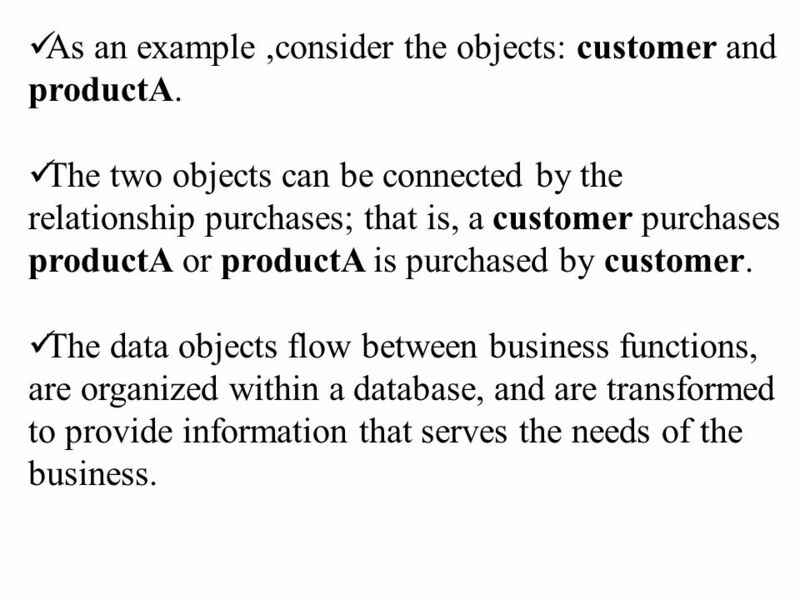 4 As an example,consider the objects: customer and productA. The two objects can be connected by the relationship purchases; that is, a customer purchases productA or productA is purchased by customer. The data objects flow between business functions, are organized within a database, and are transformed to provide information that serves the needs of the business. 5 The application architecture encompass those elements of a system that transform objects within the data architecture for some business purpose. 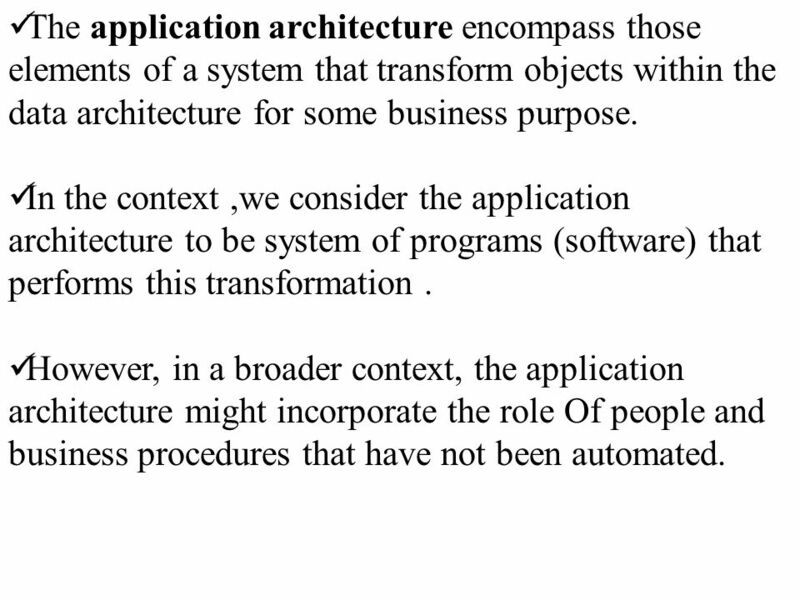 In the context,we consider the application architecture to be system of programs (software) that performs this transformation. However, in a broader context, the application architecture might incorporate the role Of people and business procedures that have not been automated. 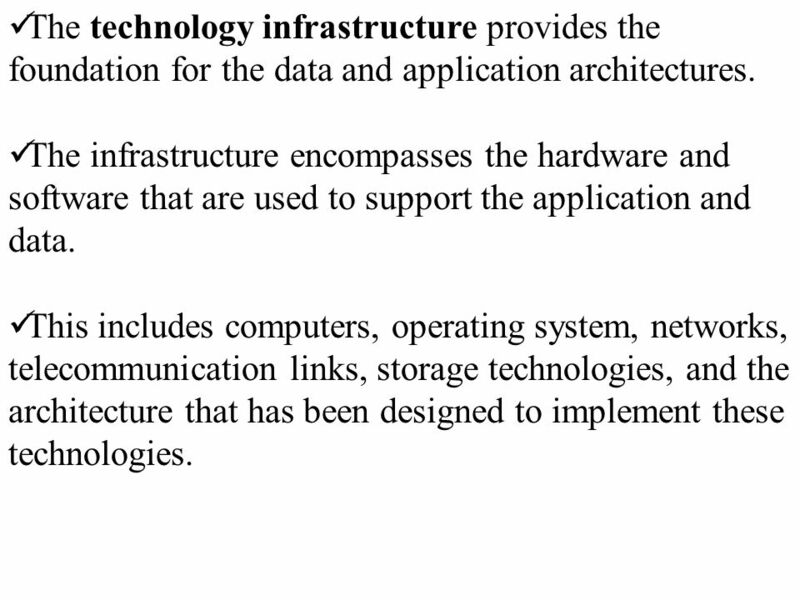 6 The technology infrastructure provides the foundation for the data and application architectures. The infrastructure encompasses the hardware and software that are used to support the application and data. This includes computers, operating system, networks, telecommunication links, storage technologies, and the architecture that has been designed to implement these technologies. 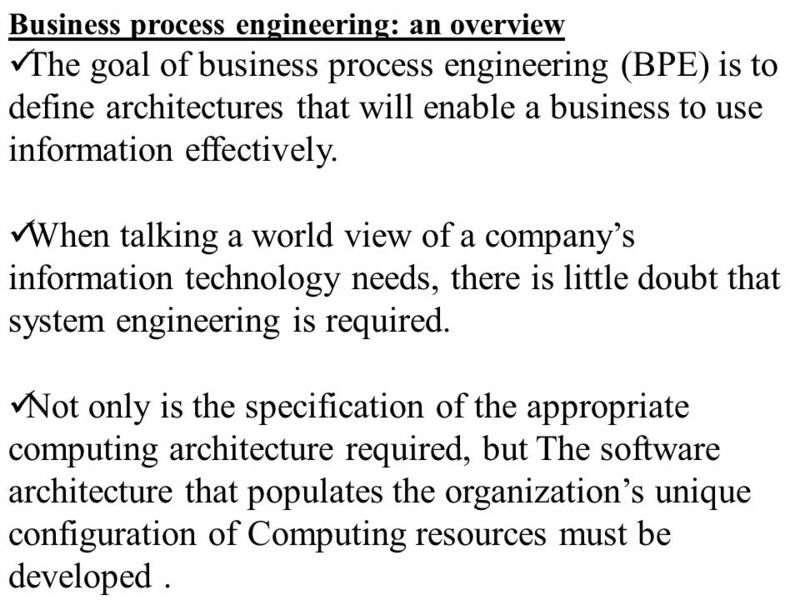 Download ppt "Business process engineering: an overview The goal of business process engineering (BPE) is to define architectures that will enable a business to use." STORAGE MANAGEMENT/ GETTING STARTED: Storage Management 101 Everything you always wanted to know about Storage Management (but were afraid to ask) Stephen. Prentice Hall, Database Systems Week 1 Introduction By Zekrullah Popal. ©2002, Pearson Education Canada 1.1 c h a p t e r 1 1 MANAGING THE DIGITAL FIRM: CANADA AND BEYOND CANADA AND BEYOND. Discovering Computers Fundamentals, 2010 Edition Living in a Digital World. Final Project David Arzabe M.  As the Internet spread over the world during the 1990’s, businesses started noticing opportunities for using the new technologies. © 2005 Prentice Hall7-1 Stumpf and Teague Object-Oriented Systems Analysis and Design with UML. 9/6/2001Database Management – Fall 2000 – R. Larson Information Systems Planning and the Database Design Process University of California, Berkeley School. Components and Architecture CS 543 – Data Warehousing. 1 Objective of today’s lesson S oftware engineering occurs as a consequence of a process called system engineering. Instead of concentrating solely on. Introduction to Information Architecture Informatics Training for CDC Public Health Advisors. Introduction to Computers Lesson 12A. home Information System A mechanism that helps people collect, store, organize and use information.